The Atlantic Ocean is this beach house’s backyard in Florida. As you enter this home, you start to feel at ease, the rooms flow together like the ebbs and flows of the waves rushing to shoreline. The interior designer Lauren Leonard, magically designed a house that just has you wanting to stay and enjoy the day, every room has some detail that mesmerizes you…like a beautiful sunrise at the beach…you just can’t believe how lucky you are to have caught the magic …blue, white, grey and soft sand colors are staples in a beach house, but not every designer can make it work effortlessly and as perfect as in this home…so beach pretty! 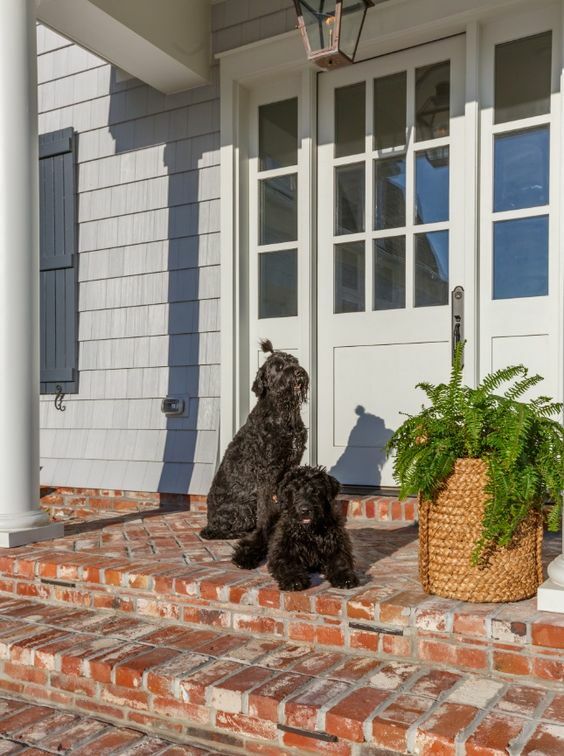 Well what a beautiful beach house entry way, sometimes less is more! 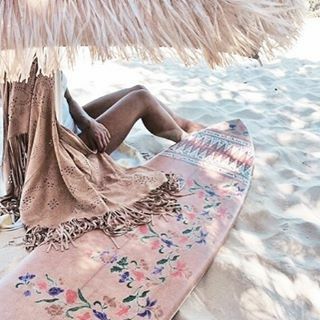 A beach house is always expecting company, and these leather luggage racks are so popular right now..and I can see why..I love them. 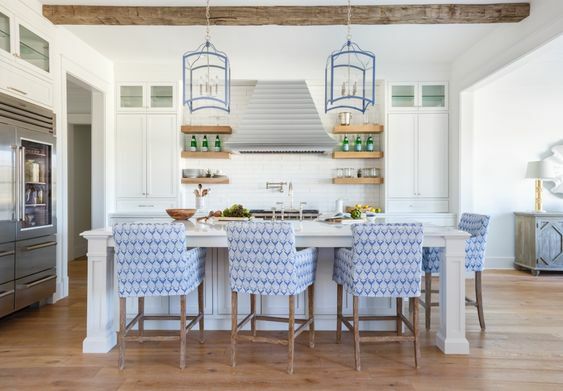 How pretty are these upholstered blue kitchen chairs and blue trimmed kitchen pendant lighting? Kitchen splurge, built in wine refrigerator and bar..a must for any dream home! Even the pantry is incredible..I love this shade of blue! The beams on the ceiling look like driftwood, another detail that makes this house extraordinary. How stunning is the tile in the laundry room…again the designer makes every room so very pretty, without complicating the look..perfection. This Steel Framed Open Canopy Bed is Classically Elegant…and behind the bed, the wall is dressed in a deep blue grasscloth wallpaper…another mesmerizing detail. Pretty Details…Blue and White Roman Shades and an Exquisite Bamboo Mirror. Soft and Pretty…Light Blue Upholstered Headboard and Designer Pillows…lovely. What a Lovely Desk for A Little One.